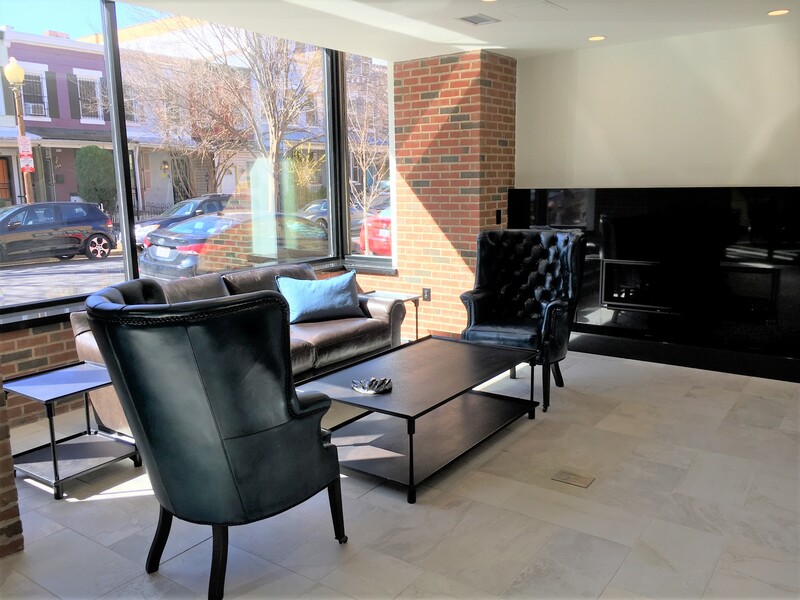 Development | Park View, D.C.
Over the weekend, I had a chance to catch up with 1A09 Commissioner Michael Wray and tour the Arcade Sunshine apartments at 715 and 735 Lamont Street, NW. 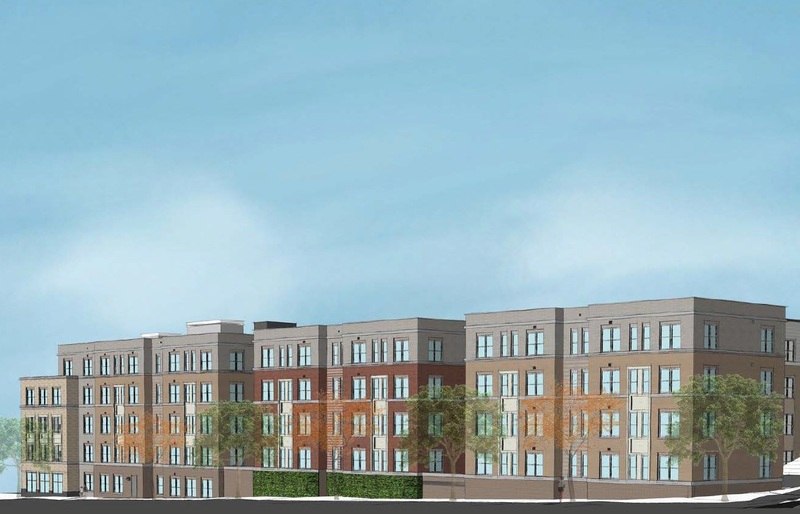 As many may recall, this is a project that has been in the works since mid-2014 and when fully completed will add about 225 units of housing and 102 parking spaces for its residents. 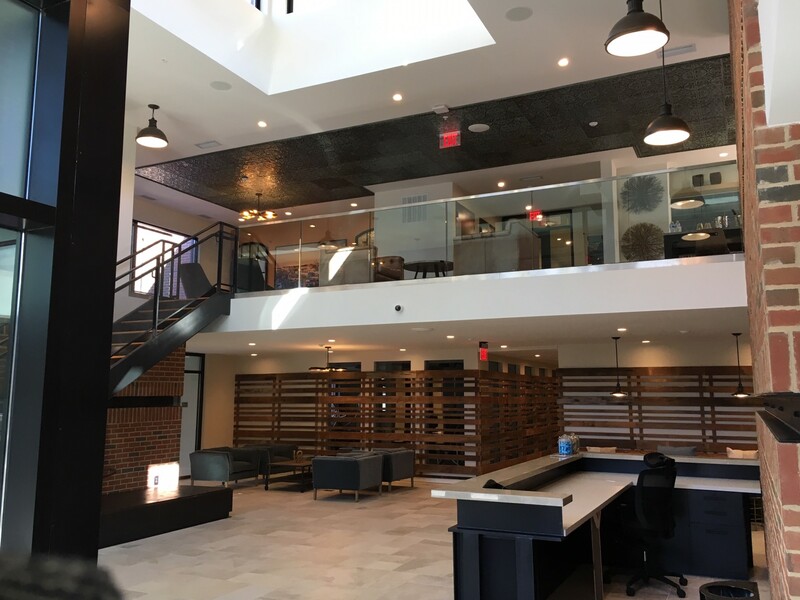 I’m particularly please as I was able to negotiate the preservation and reuse of the Lamont Street facades into the new development creating an interesting mix of old and new. The site was originally constructed as an industrial cleaners ca. 1919 and was in continued use as such until its recent conversion into new housing. 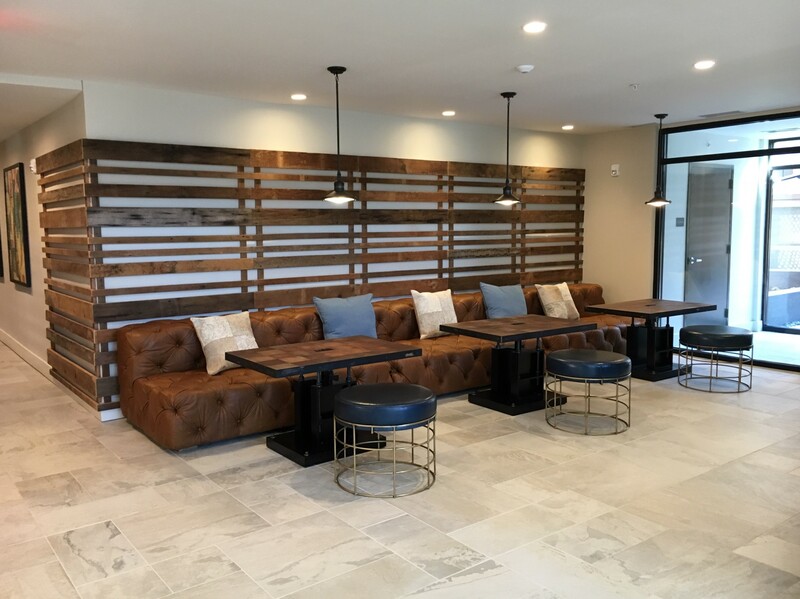 It is currently leasing providing the opportunity to schedule a tour. I’m providing photos here so you can get some idea of how well it turned out. You can also review the apartment floor plans here. 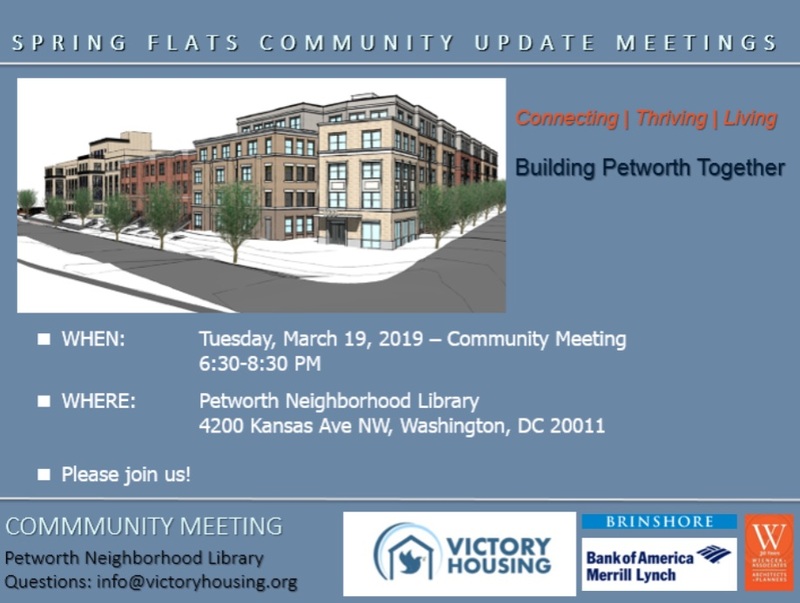 A good number of neighbors attended the Hebrew Home redevelopment update meeting at the Petworth Library on March 19th. The primary objective of the meeting was to learn where the project for 1125 Spring Road, NW, is and what progress has been made since the project got the green light to move foreword. 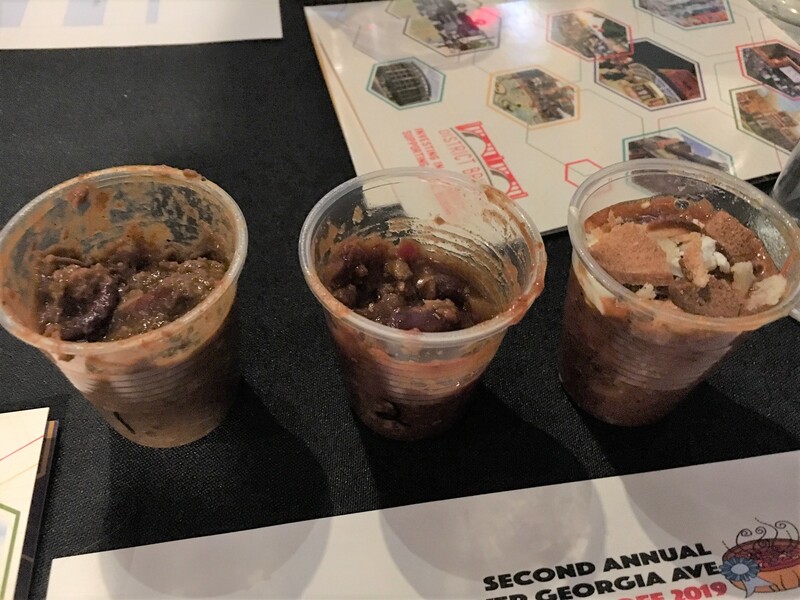 While the development team is still fine tuning the project, key updates shared focused on approvals the project has received to date, design element refinements, and the basic timeline for when construction would begin. 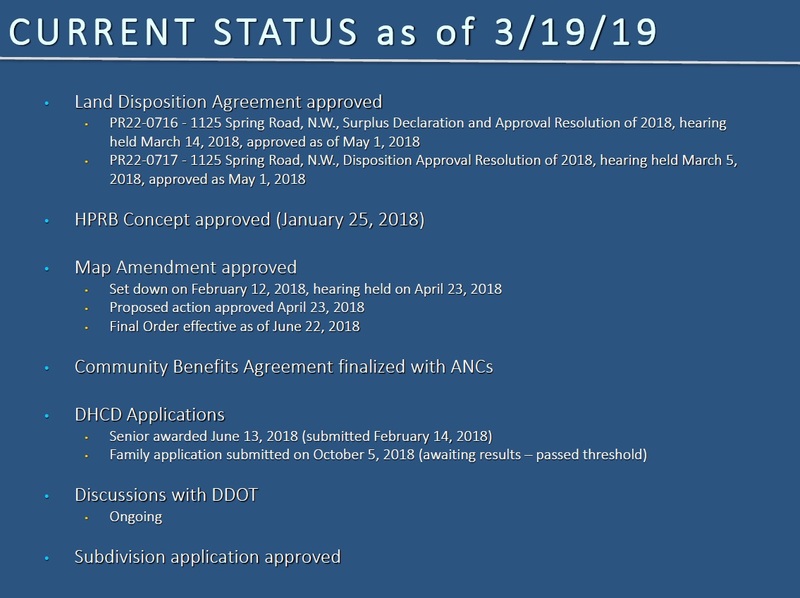 Current status of approvals as of March 2019. The plans for the historic Hebrew Home building were approved by the HPRB in January 2018, following Victory Housing and Brinshore being awarded the project in August 2017. When completed, the development will include the creation of 187 residential units through a mix of townhomes and apartments. The project will include the creation of 88 units of affordable housing for seniors at or below 60 percent Area Median Income (AMI) through the adaptive preservation of the historic Hebrew Home building as well as the creation of 62 units of affordable housing in a newly constructed building at the current site of the Paul Robeson School. Currently the team is continuing to work on design and financing stages of the project. They anticipate several more months of work before construction can begin, and that will be once all the financing is in place. Optimistically, construction could begin in late 2019. Conservatively, construction could begin by January or February 2020 at the latest. Both the renovation of the historic Hebrew Home building and the new construction next door would begin at the same time, though they would likely be completed at different times. Once construction begins, the historic renovation should take approximately 14 months to complete, while the new family building would take approximately 18 months to complete. Overall, most residents who asked questions and commented on the 1125 Spring Road site expressed a spirit of support for the effort. The chief area of frustration centered on the issue of neighborhood parking and frustration with the District Government for not doing more to leverage District resources to assist with the parking needs of Raymond Elementary, the Raymond Recreation Center, and neighbors. 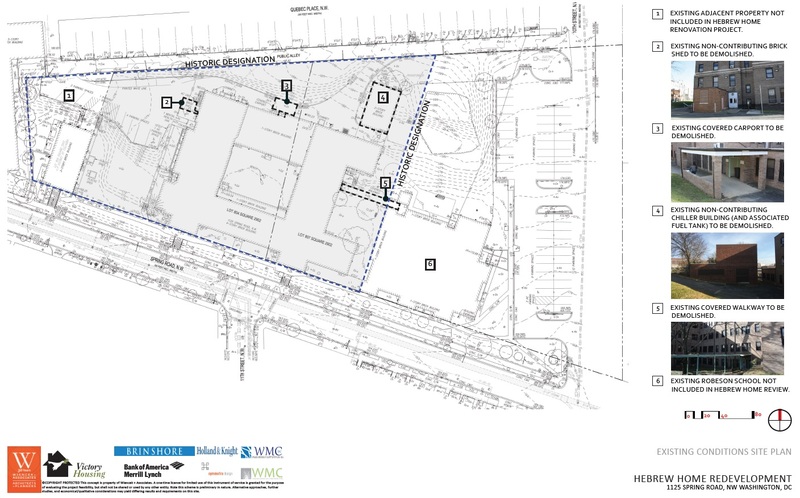 For example, Raymond Elementary has a large surface parking lot to the east of the building, yet DCPS has expressed that the parking lot is for the sole use of the school and not open to either the community or rec center to use. I, along with others, expressed that this is unacceptable as the school is District property. Furthermore, the recreation center was rebuilt as an extension of the school so that the school has use of the rec center during school hours as an extension of their programs. When the school is not in session, the school property must equally be flexible and available to support the needs of the rec center. Clearly there is more work to do regarding the parking issue and DCPS’ rigidity with access to their property. 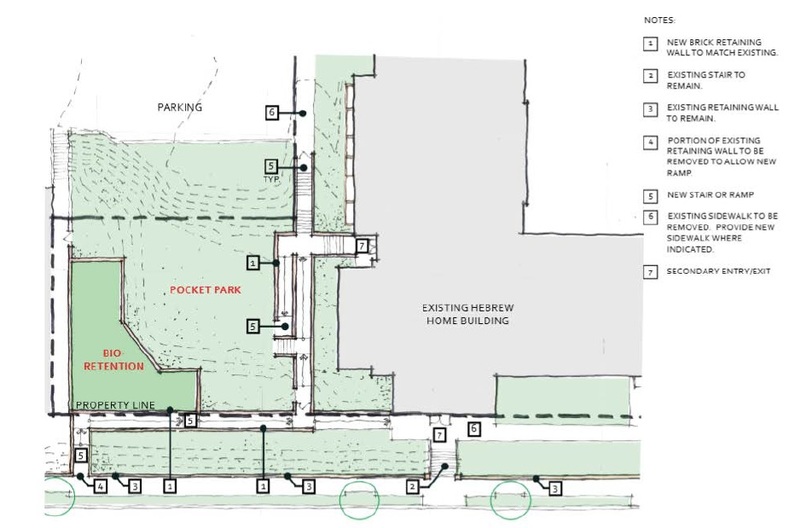 In reviewing the boards and other information that was available, I also noticed some programming and rough plans for the pocket park that is located to the west of the Hebrew Home building. I’m including that image below to show the progress on that aspect of the project. The development team working on renovating the historic Hebrew Home and developing new housing on the remainder of the property is hosting a community meeting tonight. Aimee McHale from the Deputy Mayor of Planning and Economic Development’s office sharing information with the Committee. 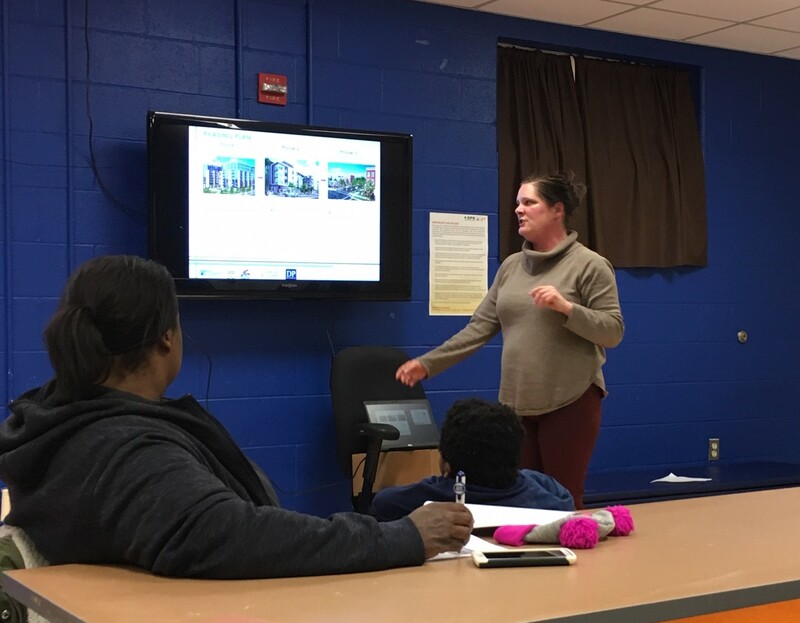 Last night’s community Park Morton Steering Committee Meeting offered and overview on where things stand regarding the plans to replace and rebuild Park Morton in three phases over two sites. The key information points that were shared centered around the following. 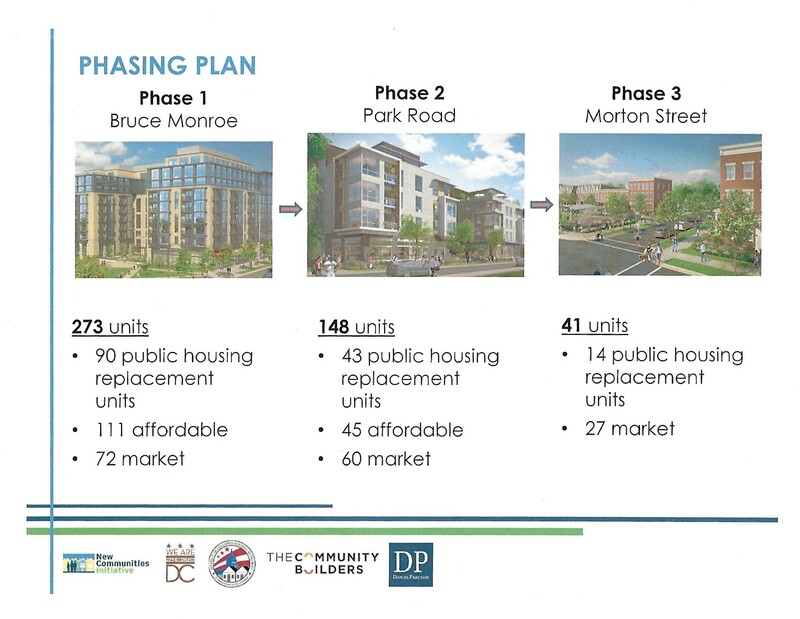 As people may recall, the Park Morton redevelopment effort broke down into two zoning cases, one for the current Park Morton site (ZC 16-12) and one for the former Bruce Monroe site (ZC 16-11). Zoning Case 16-12 was not appealed, but Case 16-11 was. Oral arguments for the zoning appeal were heard before the Court of Appeals on February 14, 2019. There was no decision following oral arguments and there is no required time by which the Court of Appeals must render a decision. Based on past cases, a decision could be between 2-18 month. It is estimated that construction could start 6-9 months after the appeal is resolved. 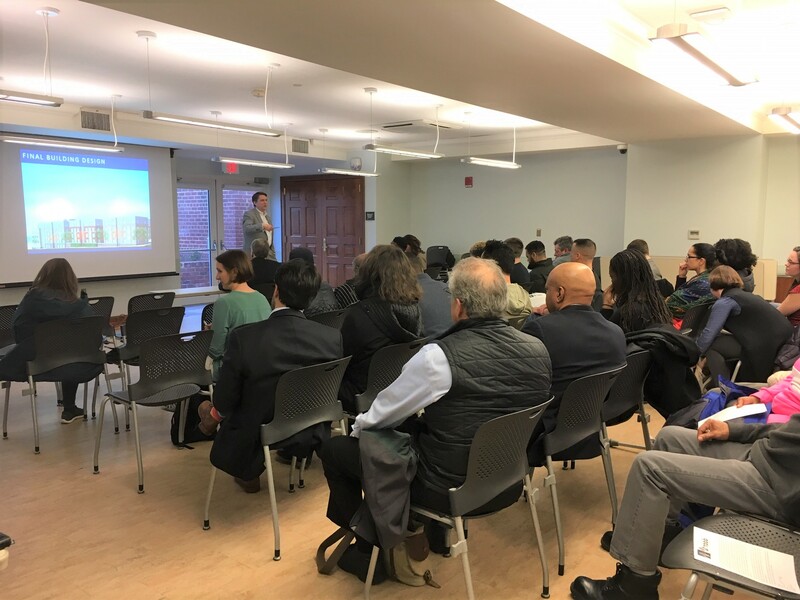 The second significant update that was presented was the DMPED funding assistance to the DC Housing Authority (DCHA) to perform interim controls. In 2018, DCHA did environmental studies at its properties throughout DC. At Park Morton, they discovered lead which required remediation. Due to the expense and with redevelopment looming, DCHA initially indicated that it wanted to move residents out and just replace existing buildings. This would have resulted in displacing families which the ANCs, Council, DMPED, and New Communities Initiative are all dedicated to preventing. 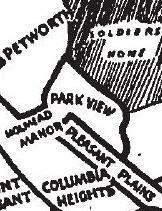 The current plan is for a phased replacement that does not displace our neighbors. 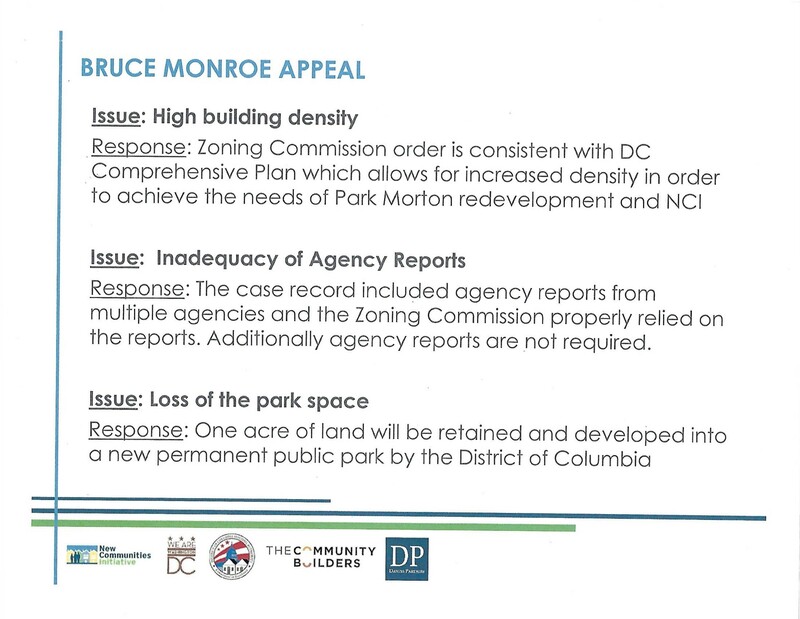 In order to keep the promise of a development that is constructed in phases without displacement, DMPED agreed to assist DCHA with $4.5M in funding to address the lead and other maintenance issues present at Park Morton that must be addressed between now and the start of the redevelopment. Another focus area of the meeting concerned the number of units, the affordability of the units, and how many bedrooms each unit had. This was largely a review, but emphasis was made that families living at Park Morton would move into new units once constructed that were appropriate to their needs. 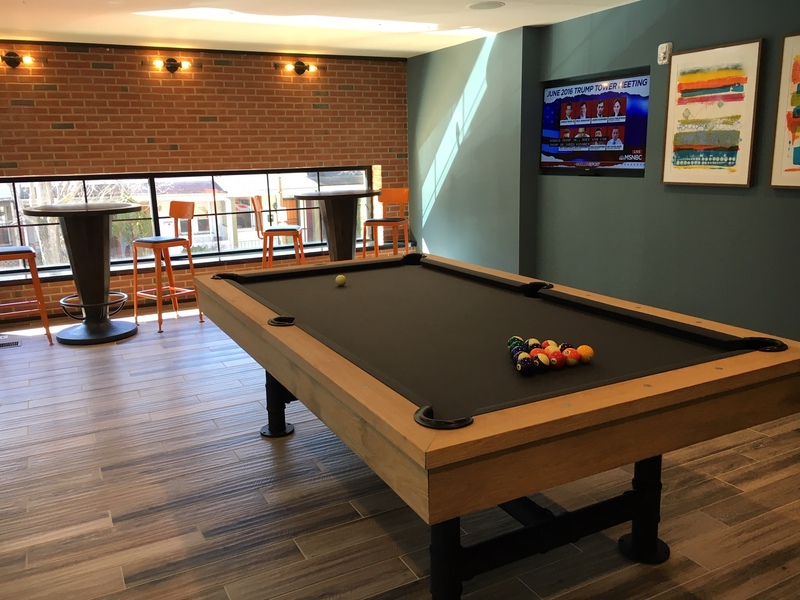 Currently, every Park Morton apartment is a two-bedroom apartment. Some families only need a one-bedroom apartment and others need apartments that are three- or four-bedrooms. 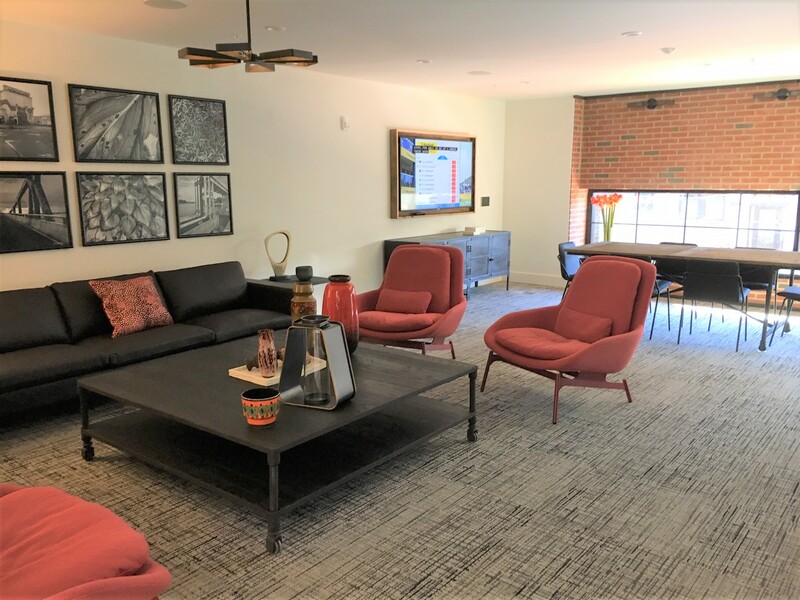 To determine the right size apartment for each family, DMPED has been conducting household surveys and using data from DCHA to identify the various apartment sizes that are necessary to meet the needs of families living at Park Morton. At a very high level, the slide below shows how many housing units will be produced during each phase and where. The meeting closed out with a Q & A session where questions were asked about job training programs and neighborhood investment in addition to additional information in the areas from the presentation. Here’s a chance to get caught up on where things are with the redevelopment of the Hebrew Home project! The Development Team for Spring Flats (1125 Spring Road NW) will be providing community members with an update on their progress on both the senior-only housing building (the former Hebrew Home) as well as the new construction (single-family condos and multifamily building on site of former Robeson School) next month on Tuesday, March 19 from 6:30-8:00 pm at the Petworth Library in the large meeting room downstairs. 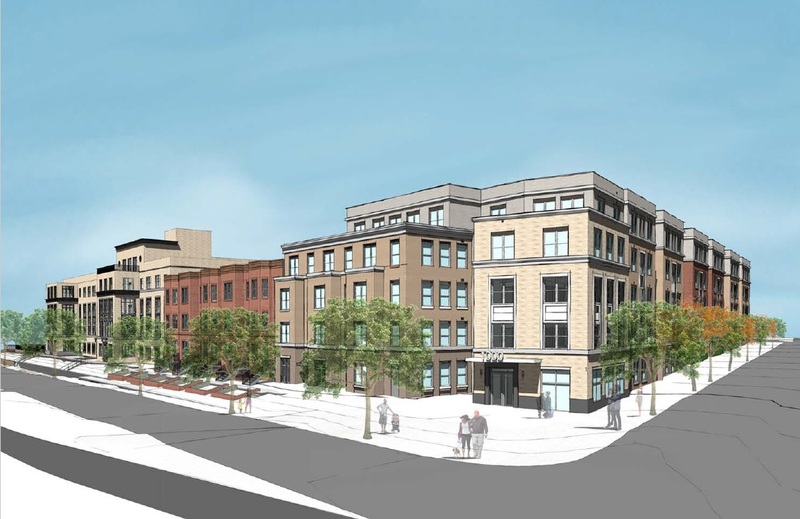 Since the team has now submitted their building permit and public space permits applications for approval from the District, they will be presenting updated renderings of what the development will look like — and provide neighbors with an updated timeline for construction. City agencies, including the Deputy Mayor’s Office for Planning and Economic Development (DMPED), will also be attending the meeting in order to provide the community with an update on the ongoing work that various city agencies (DPR, DCPS, DDOT, and DGS) are making on looking at existing traffic and parking issues related to Raymond Elementary and Raymond Recreation Center and coming up with strategies for mitigating the impact that the development will have on issues in the neighborhood. 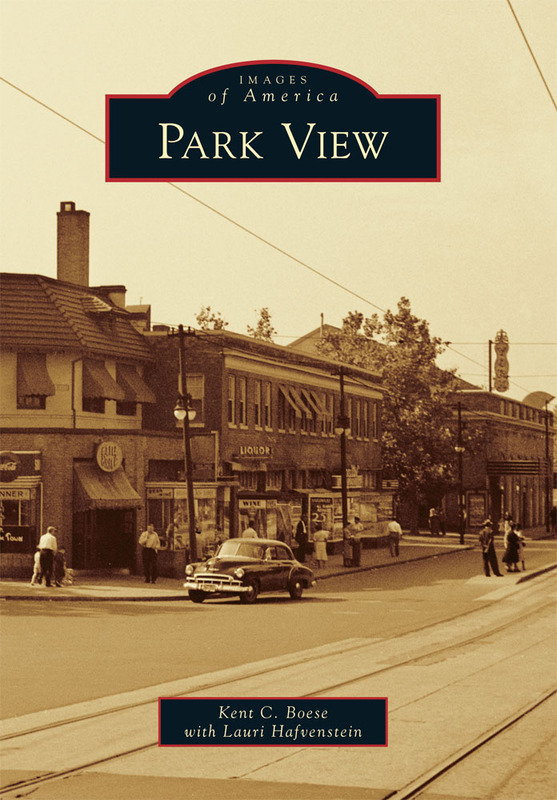 Curious about where things stand with the redevelopment of Park Morton? Then join the Park Morton Steering Committee on Thursday, February 28th to learn about recent events and updates to the redevelopment effort. See the flyer below.